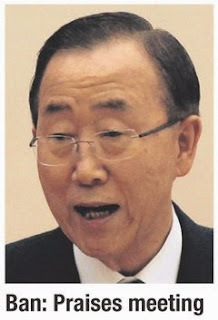 UN secretary-general Ban Ki-moon has expressed support for Thailand's plan to hold a regional meeting in Bangkok on May 29 to address the Rohingya migration problem. During a telephone conversation with Prime Minister Prayut Chan-o-chan Sunday, Mr Ban praised the meeting as a significant initiative to seek international cooperation to solve the growing crisis, a member of the government spokesman's team, Maj Gen Weerachon Sukhontapatipak, said. Mr Ban said Rohingya migrants should be accorded the human dignity and basic rights they deserve. Senior officials from 15 countries including Indonesia, Malaysia, Bangladesh, Australia, the United States, as well as international organisations, are likely to attend the one-day meeting. Myanmar has suggested it may not attend. Gen Prayut told Mr Ban he was also concerned about the Rohingya migrant crisis, and said authorities are monitoring the situation closely. Gen Prayut said the government realised the urgency of solving the issue, and stressed that countries in the region and international organisations must work together to come up with solutions. He said the United Nations also must play a major role in coordinating international efforts to address the problem. He urged the UN to focus on tackling poverty, which is one of the key factors behind the ongoing exodus of the ethnic Muslim minority from Myanmar's Rakhine state, and to find ways to improve their quality of life so they can enjoy their basic rights, Maj Gen Weerachon said. Gen Prayut said the regional meeting will be a forum for all concerned countries to share their views. He expects the meeting will show Asean countries' unity and responsibility towards fellow humans. The premier said Thailand has treated Rohingya migrants based on humanitarian and human rights principles, according to Maj Gen Weerachon. Deputy government spokesman Maj Gen Sansern Kaewkamnerd said Sunday all Rohingya people entering Thailand are regarded as illegal migrants under Thai law, although the country is willing to provide them with humanitarian assistance. Naval authorities have stepped up sea patrols to monitor Rohingya migrants' vessels in Thai waters and provide them with food and drinking water, and repair their vessels so they can continue with their journeys to their destinations, Maj Gen Sansern said. He said the government has cracked down on networks involved in Rohingya trafficking to prevent them from using Thailand as a transit route for people trafficking. Sunai Phasuk, a Human Rights Watch representative in Thailand, said Asean and the West should pressure Myanmar, which refuses to recognise the Rohingya as one of its ethnic groups, to do more to solve the Rohingya problem. Mr Sunai said several countries have softened their stance against Myanmar, which has won praise for enacting widespread economic and political reforms since it emerged from outright military rule in 2011. However, there are growing worries concerning human rights in Myanmar. Mr Sunai cited a Human Rights Watch report, saying Rohingya people have been persecuted in Myanmar in violation of international laws. The UN has urged Thailand to build temporary camps for Rohingya migrants, although Thailand is still reluctant to shoulder sole responsibility of looking after migrants out of concerns for national security and the costs involved. Mr Sunai said Thailand should ask the United Nations High Commissioner for Refugees (UNHCR) to set up temporary holding centres for the migrants in Thailand as the UNHCR has experience in screening migrants and sending them to other countries. This way, Thailand will not shoulder the burden as the cost of running the camps would be met by the UNHCR, Mr Sunai said.